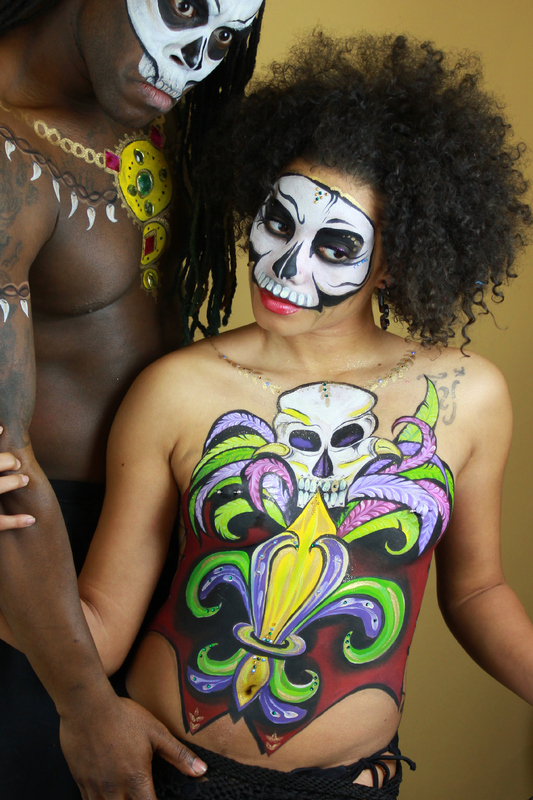 Body Paint is an amazing way to express your SELF, show your STYLE, reveal your SOUL. Bodies have warmth, a heartbeat, passion, and emotion. Body Paint is ART that BREATHES. I blend paint and sculpture and theatre to create beautiful, expressive images. I am a body artist, not a painter of naked people. There is a distinction. I look at the human body as something strong and elegant and beautiful. Commissions: If you've dreamt of being body painted, of being a PART of a work of art, or you want to show your inner self ON your outer self contact me about setting up a commissioned body paint. We will work together to find a theme and a composition that is perfect for you. It is possible to set up commissioned pieces with couples and groups as well. This is an excellent choice for maternity body painting and engagement photos! Art for Sale: Browse my Gallery for work that moves you, and move it into your own home! Commercial Body Paintings: If you're looking for a beautiful body painting for your film or advertisement look no further. Contact me for information on rates. Live Body Painting: Live body painting exhibitions or having body painted models in attendance (or a combination of the two) can add excitement to your event! I can even include your theme or logo. Private Body Painting Sessions: Are you looking for something extra fun for your girlfriend get-together? Need something extraordinary for your krewe on your Mardi Gras' Float? Searching for a unique photo opportunity for you and your bridesmaids? Want to add a unique twist on this year's family portraits? Body painting can certainly fit the bill! How did you get started as a body painter? I have a background in theater and in art. I started doing body art as a henna artist in 2000, and after a few years I started to attend a few face and body art conventions. Once I saw the body painting I was enthralled! 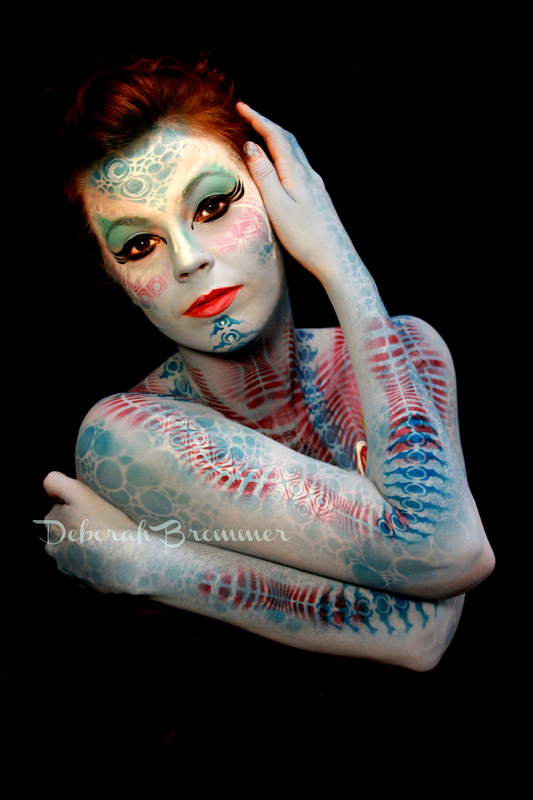 Body painting is a combination of all of my loves: body art, paint, color, sculpture, and theater. My very first full body painting was at the World Bodypainting Festival in Austria. I met so many brilliant artists there who were so supportive and helpful and they have been inspiring me ever since. I live in the South Bay area of Los Angeles California, and I have my family roots in Columbus Ohio, but I love to travel and will happily travel to you or meet you at the location of your choice. Want to do a body painting á la Gauguin in Tahiti? I'm your gal! I am a travel junkie and I have been to about 48 countries and 6 continents! I love to explore other places, taste the foods of different lands, and take in the art and culture of different peoples. Send me an email if you'd like body painting at your destination wedding or anniversary vacation and we can hash out the details. Is that all really paint? Or is it photoshopped? It IS really all paint! You can often see the brushstrokes in the final piece. However, that said, I do some finalizing of the image in photoshop to make sure that my backgrounds are black-black or white-white and to erase errant hairs or shadows or lint that may detract from the final piece of art. What kind of paint do you use? How do you apply it? I use a variety of paints that are formulated to be used on skin. Most of them are water based and I apply them with artist's brushes and sometimes with sponges, my fingers, or an airbrush. Body paint make up is highly pigmented, pliable, and dries quickly. There are many modern myths out there about actors or models dying because their skin couldn't "breathe" with the paint on, but this cannot happen with high quality body paints. I use the same products that they use on Broadway in shows like "Cats" and the same products used in productions like the Cirque du Soleil shows. How long does it take to do that? How long does it last? When painting a full body for a competition the artists are generally given about 6 hours from the time you can pick up your brush to the time you put it down. For a piece of my own or a commission piece the painting will generally take a full day, this includes painting and photographing the work. Then the model washes it down the drain at the end of the day!